Need to stretch your apps budget? 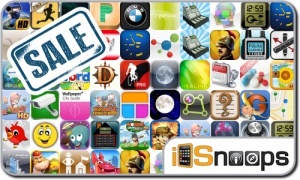 Here are 56 iPhone, iPad and iPod touch apps that just went on sale. This app deal alert includes European War 3, Worms 1 & 2, Worms Crazy Golf, Great Little War Game, Gold Miner, Cow abduction, Celestial Defense, Photo Measures, Secret Photo+Folder, Live Cams Pro, and many others.